Before service members head to the war fields of Afghanistan and Iraq, they focus on battle prep. The precision it takes to ready forces helped teach Isaac what it takes to prepare. From Oregon to Louisiana, and Iraq to Afghanistan, Army National Guard Gunnery Sergeant Isaac Engle has been using his expertise with ordnance to train and protect service members downrange. He's a decorated veteran of two tours of duty, and he continues to impart his knowledge and experience to the next generation of guardsmen and guardswomen. He's also a family man, a born leader and teacher, and more recently, an aspiring pro bodybuilder. With time, patience, and the military ideals he learned through service, this man will get what he wants in life. Look for him on the stage soon! I have always wanted to have a body like the guys on the cover of the fitness magazines. When I was in Iraq I saw one of Greg Plitt's cover shoots and said I would love to do that. Unfortunately I never knew what I was doing in the gym. I would go in there and do the exercises I saw other people do. So when I got started on my journey of transforming my body, I started using the P90X DVDs that I bought a few years back, but never touched. I even bought the Insanity DVDs as well. I guess you could say I'm kind of a sucker for infomercials. I'm not going to lie: I did see results from doing the exercises. But I wanted more than what they could give me. I wanted size, strength, and more importantly, knowledge. That is when a buddy in my unit showed me the Bodybuilding.com website. I would say that is when my transformation took off. 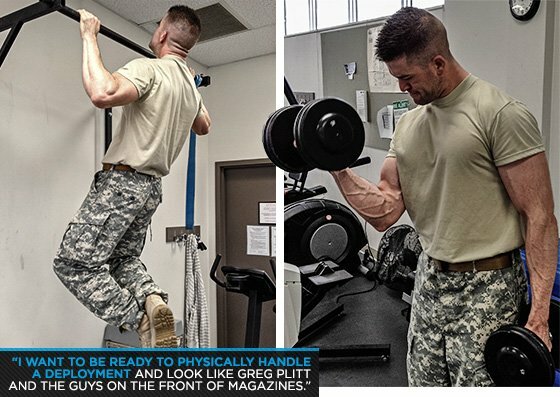 As far as what got me started, I wanted to be ready to physically handle a deployment and to look like Greg Plitt and the guys on the front of magazines. Well for me there wasn't anything that was too difficult when transitioning from a civilian to a Guardsman. I always wanted to serve my country and state, and in the National Guard you have the best of both worlds. However, I have noticed that the younger generation struggles with the idea of being told what to do, and to do it without questioning the leaders. As a full-time Guard member during the week, I work for our Pre-mobilization Training Assistant Element (PTAE). My duties are to help the Oregon Guard units inside their one year pre-deployment window to get all the training, qualifications, and documentation done so when they go to their active duty pre-deployment site, it is as fluid as possible for them. During my drill weekend once a month I am a Gunnery Sergeant for our Artillery Battery (2-218th FA). As a Gunnery Sergeant I assist the platoon leader in the planning, preparation, and execution of collective training activities for the platoon. I conduct battery and platoon reconnaissance, selection, occupation, and defense of position areas. I supervise firing, battery personnel engaged in firing, battery operations, maintenance, and training. I lay the unit for direction of fire and verify safe operations before and during firing. I supervise battalion ammunition operations. I review, consolidate, and prepare technical, personnel, and administrative reports covering firing battery element activities. When I went to Iraq I had just finished Infantry Basic Training so I was in good shape, however I did injure my back during that deployment. So leading up to this last deployment to Afghanistan, I knew I had to get in shape and fix my back. I knew if I was going to be wearing my gear and patrolling at elevations above 6,000 feet I better be in shape. I probably would have become a cop or a firefighter. I have always enjoyed helping others. That's why I want to make a name for myself in the fitness community: so I can inspire and help others. As a soldier I don't think it is that important to do well on my PT test. It doesn't accurately measure someone's overall fitness levels. That being said, as a platoon sergeant I think it is important to set the standard for my soldiers to follow. For me it is leaving my family for the deployments and the different schools that the military sends me to. Personal Sacrifice Is an Accepted Part of the Military. How Does That Translates to Fitness? For me personal sacrifice has to happen every day. I love food and unfortunately it isn't always the healthy food. I have to remind myself that poor food choices won't get me where I want to be in my fitness life. I am a National Guard Senior Leader, so I feel it is important for my soldiers to see me set the right example. Unfortunately there are too many service members that aren't as in shape as they should be. I change up my workouts all the time, but I try and keep powerlifting moves at the beginning of every workout. Every week I change up my rep range like on the YT3 program. I try and get creative when it comes to what exercises I am going to do on any given day. The only thing I keep the same is that I attack my weak areas with tons of intensity. Given that I just decided this last year while in Afghanistan that I would like to compete as a fitness model and bodybuilder, I want to start competing in 2014 and would like to get my pro card by the end of 2015. It would mean a lot to me to earn my pro card. I think it would help solidify who I am and what I have accomplished in the fitness industry while I finish my degree and strive to become a fitness model and sports fitness consultant. It has shown me that I have the perseverance and discipline to accomplish any task set before me, both in garrison and down range. Bodybuilding isn't a simple change to someone's body like tattoos, clothes or a hairstyle. It takes time, dedication and perseverance to change your physical appearance. Arnold Schwarzenegger will always be a favorite. I like following Jay Cutler and Flex Lewis, but as far as people I would like to look like, my three favorites are Steve Cook, Rob Riches, and Greg Plitt. Consistency is the key. 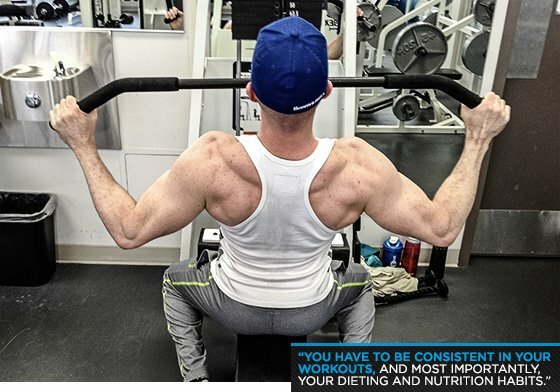 You have to be consistent in your workouts, and most importantly, your dieting and nutrition habits. Being consistent is also the key to achieve your goals outside the gym as well. In today's day and age, we have the microwave mentality, meaning we want everything right now. 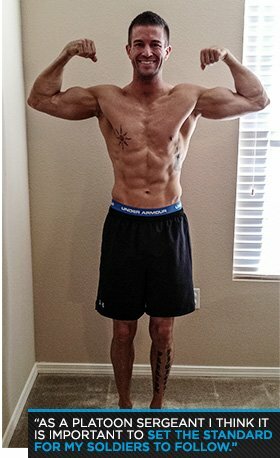 Unfortunately, with bodybuilding there is no way to have the body of your dreams right away.